Install your fence correctly the first time around! If you’ve been thinking about installing a residential fence for your property, here is a guide to what types of questions you should ask before investing. There are many factors you should consider before moving forward with a fence installation. The size of your property, the length, height, and type of fence you should install, and the overall purpose of the fence will all be important considerations. Grab a notepad to start jotting down some notes to discuss with Hercules Fence. Have you consulted your home owner’s association about installing a fence? Have you checked the zoning laws for your neighborhood and property? These two factors will impact what type of residential fence you can install, or if you’re allowed to install one at all. You may also want to let your neighbors know about the installation ahead of time so that they aren’t caught off-guard by the construction. Answers to these questions will also give you valuable information about any permits you may need to proceed with building. They’ll also provide you with insight into whether your land needs to be surveyed for buried utility lines. Have you considered that the climate in which you live will play a role in what type of fence you install? Depending on the weather statistics where you live throughout the year, one material may give you more longevity than another one. Vinyl is usually a durable choice in any environment, but wood, iron, or another type of metal could be impacted by high humidity and heavy rain. Also, consider the time of year that you’d like to install your residential fence as the softness or hardness of the ground will impact the integrity of your new fence construction, and maybe even the cost. 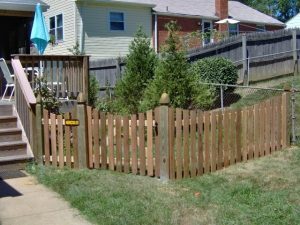 What purpose will your fence serve? Have you gone outside and really surveyed the space that you want a residential fence to occupy? If privacy is a concern, take some measurements so that you’ll have an idea of the height and length that you desire. Do you want your fence to feature a gate for entry? How about the security of your fence and if it should touch the ground? The answers to these questions will also help lead you in the right direction. This entry was posted on Friday, October 13th, 2017 at 3:25 pm. Both comments and pings are currently closed.